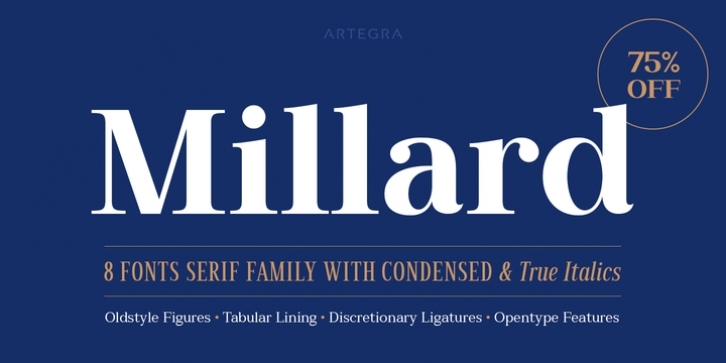 When you need a classic serif typeface that is up to the modern standards, Millard comes to your rescue with its alluring beauty and legibility. You have a contemporary serif family that offers great variety with regular and bold weights in both normal and condensed widths, along with their true italics. Over 500 glyphs in each font offers you the language support you need for all the Latin languages. Opentype features of oldstyle and tabular lining takes care of all your numerical text needs. Complete set of ligatures and discretionary ligatures adds the necessary decorative elements to your design while making it even more enjoyable to read. Language localizations such as transforming acute diacritic to kreska for Polish language is included. Millard works perfectly as both a text and a display family, makes it a go-to typeface for editorial, branding, logo, poster, packaging, web design and wherever else you need that classy look.